OK, it's semi-official. 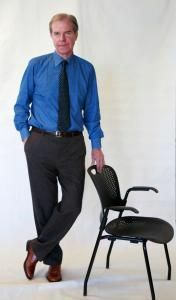 Nicholas Negroponte is thinking out loud, where we can hear him, about running only XP on the XO. What will Negroponte say now? "Eventually Windows might be the sole operating system, and Sugar would be educational software running on top of it." Notice the words "eventually" and "might". The deal is not done, or it appears even under serious discussion with Microsoft, so it isn't fully official yet. Negroponte is famous for shooting off his mouth like this. But if he means it, I'm going to start the fork of Sugar myself. 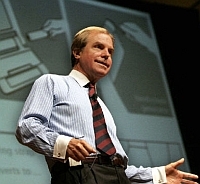 Negroponte said he was mainly concerned with putting as many laptops as possible in children's hands. I have written about this before. Negroponte is attempting to optimize on only one variable out of the full equation, and that only in the short term. Another major variable is source code availability for student programmers. Yes for Linux and Open Source generally, no for Windows. Then there is cost, which is necessarily higher for Windows, because it requires more hardware than Linux. Language support is possible for any community in Linux, but in Windows it depends on the good will of Microsoft, or rather the bottom line market analysis results that Microsoft works from. He lamented that an overriding insistence on open-source had hampered the XOs, saying Sugar "grew amorphously" and "didn't have a software architect who did it in a crisp way." Apparently he hasn't read, or hasn't understood, The Cathedral and the Bazaar, by Eric Raymond. And he apparently is unclear on the difference between R and D in R&D. If you know what you are doing, and can plan it in advance, it's big-D Development. And if you don't know what you are doing in advance, it's big-R Research. There is no precedent for the XO laptop. Of course it can't be architected crisply ahead of time. What was he doing all those years at the Media Lab if he doesn't know this? Or should I be afraid to ask that question? For instance, the laptops do not support Flash animation, widely used on the Web. Nonsense. Any user can install Flash on an XO. It is illegal to ship Flash with the XO, absent a license from Adobe. Users have to install the free download instead, giving Adobe a chance to get them to its Web site. Oh? We somehow ran away with your project that you were in charge of? Is that because you never talk to the workers? And is that because we would have quit and forked Sugar if you had told us this before? OLPC is an education project, not a laptop project. And the purpose of education in the OLPC project is to put an end to poverty. So the economics of the project matter. You have to pay attention to where the money comes from and goes to, both. It has been estimated that aid to African nations has amounted to more than a trillion dollars in the last century, and that theft of government assets in these countries has also reached a trillion dollars or more. Microsoft's monopoly position in the industry is the issue here. The children of the developing nations can have software freedoms and no-cost software, or can become Microserfs, having to pay an annual tax to Microsoft for software updates to have the privilege of using their own computers. It would cost developing nations many billions of dollars annually to buy proprietary software to match what the children can access for free in Linux. Many times more than the cost of the computers. I have run the numbers. For casual users, there may be enough software bundled with the system, but for power users and secondary school students needing the latest software technology in their textbooks, the ratio can easily reach 10 to 1 on conventional laptops, and even more on XOs. Which then is better, a slower rollout of a more effective technology, or a blitz by the monopoly power? One doesn't have to be a Fundamentalist to answer either way, but one does have to be clear on the criteria used. Are we primarily trying to benefit the poor of the world in this program, or the already rich? The rich will have plenty of opportunities to get richer by selling to the no-longer-poor if we aim mainly to support the poor, but helping Microsoft maintain its dominance will cost lives, not just treasure. 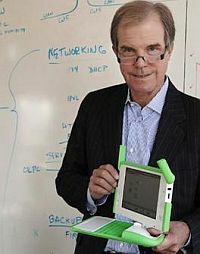 Besides rethinking the laptop's technology, Negroponte wants to get OLPC moving more efficiently. Ridiculous. OLPC is the most productive hardware and software development project I have ever seen. The only reason to complain about selling more than half a million units in less than half a year is if you believe the fantasies in last year's sales projections. Negroponte has had to admit that he didn't understand the difference between a handshake from a head of state and a signed purchase order. His problem has been believing his own marketing hype. Really. More than a million units a year run rate so far, which extrapolates to, oh, only a quarter billion dollars or so for the first year. That would be remarkable for a for-profit startup, and is unheard of for a non-profit. An executive-search firm has been looking for a chief executive for the group for more than a year. When you can't find a CEO in over a year, that should tell you something about yourself. Well, not something specific. It should tell you that there is something important that you need to know about yourself, but you don't. So perhaps you should ask. It's really disappointing having to hear that Windows perhaps will someday be the only OS on the XO. Here in the third World countries where we feel chained and impotent on how Micro$oft dominates our Government, schools and everything else, putting Micro$oft on the XO and giving it to school kids sounds like letting this dominance to take over from the very roots of our society: Our children !!! This is pretty sad... I'd really like to see a totally opensource educational operating system. Especially one with as many forward-thinking features as the XO has. Whatever they showed Alan, it sounds pretty exciting. Negroponte could've seen the same thing. In the long run, closed source software is a bad thing, but I can see the allure of being able to use all the shiny things in the short run. "Whatever they showed Alan, it sounds pretty exciting." That needs OOXML. Getting ODF on the XO is difficult, OOXML would be a miracle. "But if he means it, I'm going to start the fork of Sugar myself." By all means. There's no-one stopping you although if you effort from a year ago on the OLPC 101 book (that you 'almost finished' then)is of any indication there's not much substance in any of your rather verbose and overblown post here and on the devel list. XO are at mature point where we can really see the impact on education. efforts of many on the Sugar team. - which it very much is. Roll up your sleeves folks, let's make this happen. This is craziness. Sugar on Windows is the worst of both worlds. The problem with the OLPC is the Sugar UI, not the underlying Linux OS. An OLPC without Sugar, but still using the underlying Linux OS, is fast, stable and very usable. I can usefully run a number of popular educational platforms, such as Processing and Arduino. Java works fine. Flash works fine. Sugar as it currently stands is the opposite of Open Source - incompatible with other platforms, both to run on, and to communicate with. "Not long ago, OLPC undertook a drastic internal restructuring coupled with what, despite official claims to the contrary, is a radical change in its goals and vision from those that were shared with me when I was invited to join the project. Adding insult to injury, I was asked to stop working with Walter Bender, without a doubt one of the most stunningly thoughtful and competent people I've ever worked with. Following Walter's demotion from OLPC presidency, I was to report instead to a manager with no technical or engineering background who was put in charge of all OLPC technology. I cannot subscribe to the organization's new aims or structure in good faith, nor can I reconcile them with my personal ethic. Having exhausted other options, three weeks ago I resigned my post at OLPC." "People were already making a fuss about Nicholas’ claim that we’re working with Microsoft on supporting dual-boot with Windows XP, and now Bruce Perens writes a lachrymal — if entirely misinformed — missive about OLPC selling out to Microsoft. Microsoft decided to do a port, and they would have done it with us or without us — but they did something remarkable: they asked us to work with them so we don’t wind up with walled gardens. They did not set out merely to make XP boot on the XO and declare victory; they actually want to partake in as much of our learning philosophy as they can. They won’t make XP open source, but they’re building mesh support, going to great lengths to support our security and theft deterrence model, and working on allowing Sugar and Windows XOs to collaborate and share seamlessly. To set the dual-boot issue straight: Microsoft has not been working on an actual, side-by-side dual-boot system. We’re jointly making it possible to install XP on an arbitrary XO — subject to the constraints of the Bitfrost theft deterrence system — and then convert the machine back to Linux easily. One commonly-forgotten truth about OLPC is that our commitment to open source and free software isn’t religious, but pragmatic — we believe Linux and Sugar constitute a better software platform and, much more importantly, a better learning platform. Our existing customers agree, and we think new ones will continue to make the right decision while being reassured by the availability of Windows as a fall-back. To claim we should prohibit XO customers from running XP in the interest of freedom is to claim everyone should be free to make a choice — as long as it’s a choice we agree with." Why is adherence to free software "religous" in nature? RMS' resemblance to Rasputin notwithstanding, having the XO software be Free as in Freedom is very important for education; it's as pragmatic as it gets when education is your goal. As Bill Clementson points out on his blog, the XO is the first machine with a "View Source" button since the LispM! Now, come on! Is the point to just give people computers, and so very successfully give them a lot of computers? People don't learn anything about software from using Windows; plain and simple. Joel, I've been programming since I was 11 and I always used the computers that were around me: Apple II, Commodore 64, DOS, Windows 3.1, Windows 95/98... If you want to learn programming on Windows there are plenty of resources. People don't learn anything about software (I guess you mean programming) from using Windows... but you certainly can if you want to. Meanwhile, I don't agree with the Linux attitude that everybody should learn to use the shell. The thing that's religious about the RMS open-source attitude is that open source trumps all other concerns. Adobe Flash? Nobody should use that, it's not open source! There's no open source driver for your hardware? Then why did you buy the hardware?! I've never had access to the source code of my OS, but I have had access to useful code from a lot of open-source projects. One time I had to make a device driver for WinCE for my company and, without access to the source code of the fragile and underdocumented subsystem with which I had to interface, words can't describe how difficult it was. But for ordinary app development, lack of OS source code doesn't bother me. So to me, the fact that Windows is closed-source doesn't matter so much, except from the point of view of device driver developers. What does matter is that Windows costs money (for first-world buyers, the OEM version costs more than $100--which makes no sense on a $100 or even $200 laptop); that Microsoft is a monopoly (so even if they give the OLPC project a deep discount, they can't trust the price to stay down forever, nor can they rely on ongoing support for the version of Windows they might want to put on the laptop); and that even with optimizations, it's hard to conceive that Windows XP will ever be as compact as Linux can be (which means the next XO might need more beefy hardware and thus more pricey hardware). I'm no economist, but I suspect it also matters where the money goes. From what I've heard, if the laptop costs $200, almost all of that money goes to the first world and to the chipmakers. I like that idea of assembling the laptops in the target region instead, to create jobs locally. "People don't learn anything about software (I guess you mean programming) from using Windows"
By the way Joel, it occurs to me that "View Source" might be a pretty useful feature, but even today's open-source apps don't have such a feature so I didn't think about how useful it might be. Also, most real-world apps are so complex that it's a challenge to find the part of the app you want to look at, and understand the code once you've found it. Therefore I rarely look at the source code of a particular open-source app I'm using--it's usually easier to learn what you want to know from Google or Google Code Search. But, come to think of it, Google might not be available to the third-world children, so perhaps locally-stored source code is more important than I thought. Even so, what child, even one interested in programming (what percent of kids want to program, anyway?) needs to see not only the application source code, but the OS source code as well? "People don't [automatically] learn anything about software (I guess you mean programming) from using Windows"
Free Software, GNU Philosophy, and Freedom. That's what changing the OLPC to MS Windows betrayed. And now they will be wide spread to countries that really need freedom, education and new generation for their improvement as nations. Calling RMS an Open Source advocate is as stupid as saying that Water is Oil. Free Software is not Open Source, Free Software goes beyond "Openness", it fights for Freedom, your freedom, my freedom. I hope i can keep my freedom even when many of the OLPC users lose their when they start using Non-Free Software.